Coughing in toddlers is quite common. While a cough can sound terrible, in some cases it isn’t a serious condition, but generally an after-affect of a common cold or flu. However, cough in toddler shouldn’t be taken lightly. 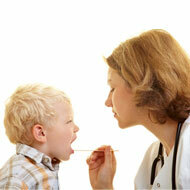 If you feel that the cough might be a symptom to something more awful, then please rush your child to a doctor. It also helps to understand the various types of cough. A toddler with cough can have any of the following types of cough. Inflammation in the upper area of the airway causes barky cough. Generally barky cough occurs as a result of swelling of the windpipe and voice box, and from croup. This occurs because of a virus, allergies or a temperature change at night. Since toddlers have smaller airways, inflammation can cause difficulty in breathing. This kind of cough can start at night, suddenly. Also known as pertussis, this is an infection that affects the airways and is caused by bacteria known as bordetella pertussis. This is characterised by non-stop cough without a break, and at the end of the cough, the child takes a deep breath that sounds like a ‘whoop.’ A low fever, mild cough, sneezing, and a runny nose are some of the other symptoms of whooping cough. This is contagious and can spread quickly from one person to another through fluid droplets that escape from the nose or mouth. Swelling in the lower airways can cause a child to make a wheezing sound while exhaling. A viral infection or asthma can cause wheezing. You will notice that coughs tend to get worse at night. Some of the other coughs are daytime cough, and cough accompanied with fever. If your toddler is suffering from cough, then you can try the following tips to prevent or treat the cough. We strongly suggest that you visit a doctor for medicines and medical treatment. But these tips can help you treat the cough at home, maybe at night time or if you’re not able to visit a doctor. Keep your carpets and rugs vacuumed and clean since toddlers and infants tend to crawl or play there, and dust mites, dust, and pet dander can cause cough and allergic reactions. Offer fluids like clear soup, fruit juice, and water to the toddler, to keep him hydrated. It is advisable to feed your child non-sugared yoghurt as the bacteria in curd can combat the infection and be good for the immune system.